A small investment & you're in the beauty business! Join The Warsh Team of anti-aging pros @ the click of your mouse... if you're interested in a new or second career, you can work for yourself and be customer-ready in two weeks. Connect with Maxine for details on how you can be your own boss within weeks. Train as an anti-aging beauty specialist in a quick launch business—an easy and budget-friendly startup in a fast growing and glamorous field. “The cosmetic microcurrent business has been rewarding for me in so many ways that I wanted to give others the opportunity to follow in my footsteps and launch a successful, profitable business. Are you ready to switch careers or be your own boss? Specialize in helping people feel better and look good. Work from home, in salons, spas, or start your own. Be your own boss in two weeks. Medicard povides online financing for medical services and training. Clients come back again and again—and are your best advertisement! Offer the best-selling WARSH Cloth--another great attraction for repeat clients! Learn how she does it from Maxine Warsh, have fun, and feel good about what you do for a living! Questions or want to get started? Contact Maxine! Learn a new professional skill and be a Pro in the beauty business. This is an easy to start business. You can be working your way up the ladder to success, certified as an anti-aging Microcurrent Pro, in days. To be working for yourself and building your business and client base ASAP, contact Maxine. Anti-aging microcurrent is non-invasive, safe, and consists of simple/relaxing treatments of 60 minutes a time, and is a great new way to start or grow your career. Work solo or in a salon/spa—add the “Electric Face Lift” to your beauty menu. Start a new venture or expand the menu in your therapeutic practice, beauty business, salon, or spa with what everyone is calling “The Electric Face Lift.” It's non-invasive, consists of simple/relaxing treatments of 60 minutes a time, and is a great new way to grow your business. 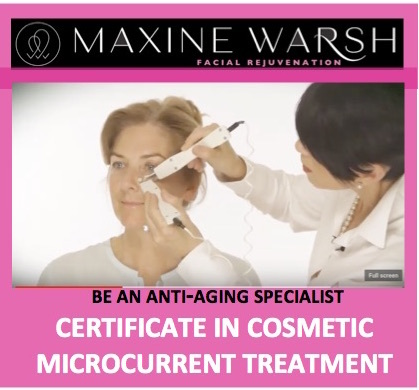 Please check with Maxine for the dates of the next anti-aging Microcurrent Pro Certificate Course. We're also planning a DIY Microcurrent Workshop. Stay tuned or ask about upcoming dates! Learn how to do it right from the expert. IS THE PEOPLE WE WORK WITH!